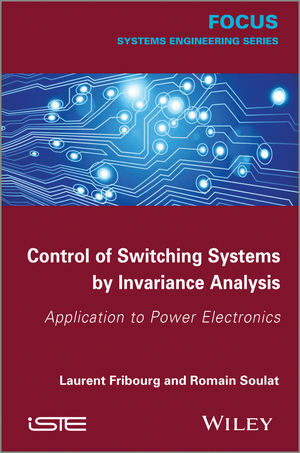 This book presents correct-by-design control techniques for switching systems, using different methods of stability analysis. Switching systems are increasingly used in the electronics and mechanical industries; in power electronics and the automotive industry, for example. This is due to their flexibility and simplicity in accurately controlling industrial mechanisms. By adopting appropriate control rules, we can steer a switching system to a region centered at a desired equilibrium point, while avoiding “unsafe” regions of parameter saturation. The authors explain various correct-by-design methods for control synthesis, using different methods of stability and invariance analysis. They also provide several applications of these methods to industrial examples of power electronics. 1. Control Theory: Basic Concepts. 5. Application to Multilevel Converters. 6. Other Issues: Reachability, Sensitivity, Robustness and Nonlinearity. Laurent Fribourg is head of the LSV (Laboratoire Spécification et Vérification) and Scientific Coordinator of the Institut Farman, Institut Fédératif de Recherche CNRS, which brings together the expertise of five laboratories from ENS Cachan, in France, in the fields of modeling, simulation and validation of complex systems. He has published over 70 articles in international journals and reviewed proceedings of international conferences, in the domain of the theory of formal methods and their industrial applications. Romain Soulat is in the third year of his doctorate at the LSV at ENS Cachan in France, under the supervision of Laurent Fribourg. He is working on the modeling and verification of hybrid systems. In particular, his interests concern robustness in scheduling problems – especially as part of a collaborative project with EADS Astrium on the verification of a component in the launcher for the future Ariane 6 rocket. He has published 5 articles in reviewed proceedings of international conferences. Laurent Fribourg is head of the LSV (Laboratoire Spécification et Vérification) and Scientific Coordinator of the Institut Farman, Institut Fédératif de Recherche CNRS, which brings together the expertise of five laboratories from ENS Cachan, in France, in the fields of modeling, simulation and validation of complex systems. He has published over 70 articles in international journals and reviewed proceedings of international conferences, in the domain of the theory of formal methods and their applications.